Intel NUC Kit NUC5i5MYHE model is based on definitely outstanding mechanical completion, although its appearance is similar to a mini PC concept, it has great expectations in enterprise area due to its intrinsic capacity. Especially, one of its features is convenient management as it loads fifth-generation core i5-5300U processor supporting Intel vPro technology. When making use of tools released by Intel, it becomes a machine very different from general PC in ways of broadcast control and many different fields. Because of this, NUC Server solution based on NUC Kit NUC5i5MYHE model introduced by True Networks Japan(www.nucserver.com) is worthy of close attention for high-end personal users’ demand and availability in industry fields such as embedded, server and etc. Particularly supports for qualified Window server 2008 as well as 2012 r2, the latest version of Linux and etc. added tremendous potential in aspect of developing marketability. While NUC(Next Unit of Computing) models, introduced in the past, played active parts mainly in digital signage and kiosk, Intel NUC Kit NUC5i5MYHE model is receiving more attention to its availability as a server on the strength of True Networks Japan’s design. Over mini PC, the model itself stood tall as a modular computing machine. The biggest advantage of using NUC in any way might be faithful function and performance compared to the size. Faithful function and performance already qualified in consumer market provide unique value in other markets, and their small packaging and low power consumption make it possible to expect more various forms in using them. Here, combination of vPro technology enforces management convenience parts provided by platform, and becomes capable of NUC making use in various fields. Test system configuration connects (is based on) Intel NUC Kit NUC5i5MYHE to (with) 8GB DDR3L-1600 single channel memory, and Intel SSD 530 series 180GB model to 2.5 type drive bay with SATA3 interface. Its operating system used CentOS’s the latest release, and NUC has great uses as an embedded and server because it can be used in not only Windows based operating system but also the latest Linux distros with no problem. The test configuration mainly composes operation performance of a platform concentrating on processors, and this reflects the feature of NUC5i5MYHE which is different from other NUC Kit models. This model is expected to be used as a server of micro form factor equivalent to embedded equipment or a micro server rather than be used in replacement of PC at home. Also, in this part, operation performance concentrating processors, service ability and etc. have significant meanings. 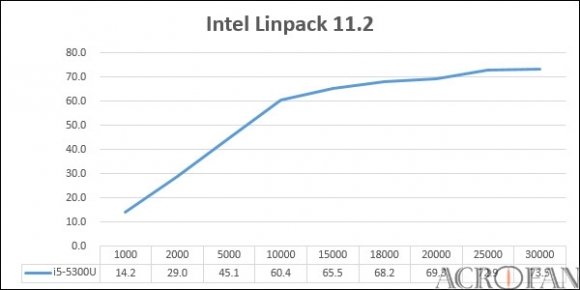 ▲ Intel Linpack 11.2 test results, unit is GFLOPS, the higher the better. 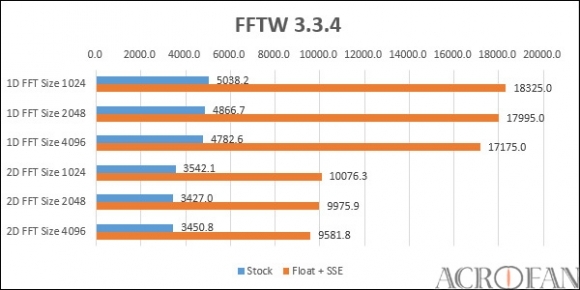 ▲ FFTW 3.3.4 test results, unit is MFLOPS, the higher the better. 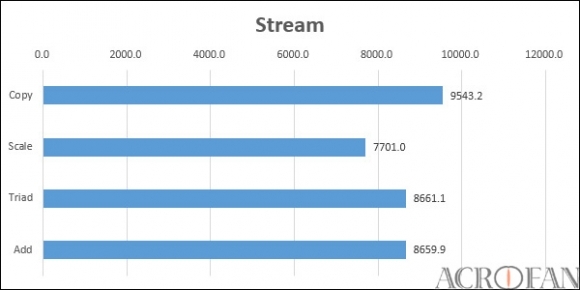 ▲ Stream test results, unit is MB/s, the higher the better. In Intel Linpack test that can be easily used as a measure of processor and system’s operating performance, i5-5300U shows professional (typical) performance which can be expected in the latest dual core processor providing (with) high motion (clock) speed. Performance improvement by using the latest instruction set is also reflected to this result, and it is compatible (comparable) with entry-leveled quad core processor of old style architecture in absolute number. Also, according to memory bandwidth, there is room for improvement when configuring memory’s dual channel, as it is a test easily affected by performance. In result of FFTW 3.3.4, each core’s ‘ability’ can be checked rather than ‘size’ of the number of cores. 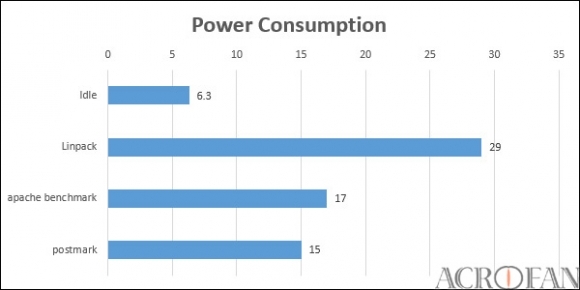 In this test, even though core i5-5300U is low power mobile processor, it has little difference in core performance when compared to general desktop consuming more power and processors for servers. At the same time, as it has relatively very small form factor, when it makes use of NUC as a server or etc., we can expect much better results from degree of integration performance per space and power efficiency than traditional rack and blade server. The actual transmission speed (bandwidth) at the grade of DDR3-1600 can be easily seemed from Stream test where we can check memory bandwidth. Maximum memory bandwidth expected from the grade of DDR3-1600 is 12.8GB/s per channel, and 8.5GB/s is gained as the actual performance from most of Intel platforms. It might be better to consider dual channel memory configuration when you use large arithmetic application that puts importance on memory performance. 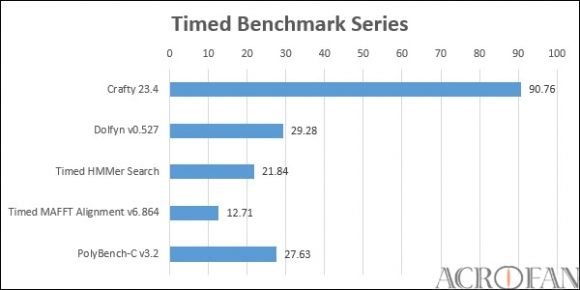 ▲ Timed Benchmark Series test results, unit is sec, the lower the better. 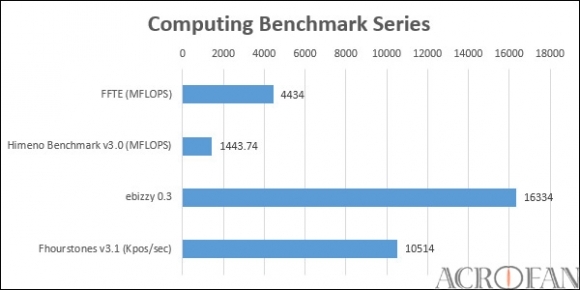 ▲ Computing Benchmark Series test results, the higher the better. At large number of tests based on performance time, the result that NUC recorded depends upon workload differences, but it shows almost no defects by comparison with existing Xeon-based systems. At tests actively using multi cores and large memories, though performance difference is big when compared to Xeon E5 types having much more cores, the difference rapidly decreases depending on properties of algorithm. For example, the result of Crafty is lower than 20% of the latest Xeon high-end configuration, but HMMer or MAFFT even shows multiples of differences. Results that NUC recorded are fairly interesting among tests mainly about arithmetic performance. There is a little gap compared to existing Xeon based systems, but when considering movement speed and the number of cores, performance shown by 2 cores 4 threads of NUC is more than expected. This can be seen as the result of efficiency improvement through adaptation of microarchitecture in the latest generation. Also, when considering the size and energy consumption, high performance efficiency stands out through advanced technology. We can expect true value of efficiency came from small size and high arithmetic performance when data center installs this NUC in highly integrated environment similar to micro server. If NUC5i5MYHE kit is raised 2U rack mount, it will fully get into. Moreover, with the size of existing 2U system, it is possible to make distributed processing environment possessing large numbers of cores and memories by accumulating dozens of NUC and consisting clustering. 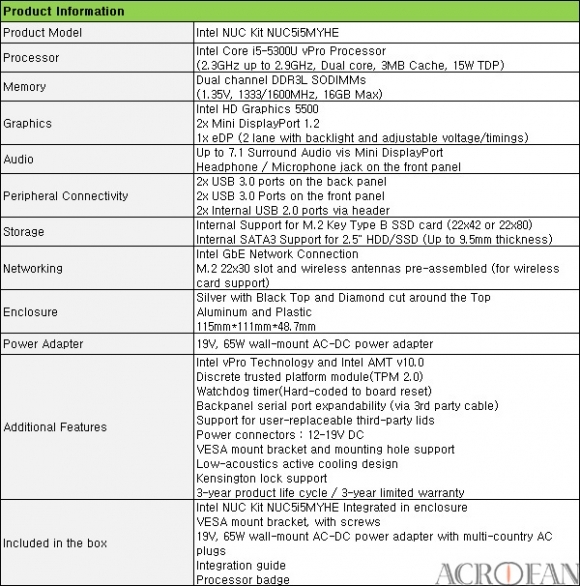 Also, at that time, the latest processor packed in small packaging provides high integration and performance efficiency. ▲ Power Consumption, unit is W, the lower the better. Through the latest mobile platform technology, in aspect of power consumption, it shows a clear level of differentiation from existing servers. Power consumption in idle state is about 6.3W in system unit, and it doesn’t exceed 20W when performing general workload. Also, it doesn’t exceed 30W per system at severe tests such as Linpack. As the basic adaptor is the level of 65W, it is affordable to configure wireless network connection or etc. by changing configuration of NUC and equipping SSD and hard drive at the same time. Characteristics of low power and heat in idle state have significant meanings for utilization as a (embedded) system. This is because, as power consumption is controlled as much as possible, if there are too many operations in idle state, high performance that is always available can be saved without any waste. Also, showing a characteristic of low heat by using the latest process, it has an advantage of maintaining a high level of reliability even in various extreme conditions. When data center uses NUC as a server, the power is not even 300W although they configure clustering with putting 10 NUC in 2U chassis. This level of energy efficiency is hard to reach in another Xeon server having the similar size. Distinctive density came out from a small form factor creates a synergy effect with energy-effective platform and performance. This was only able to be seen in low power and performance micro server so far, but NUC suggests a new direction toward this part. It is originally impossible to put a big thing into small space, but small things well adapt to big space. Likewise, if having the same function and performance, it is advantageous in many ways to make small. Therefore, more than simply PC itself, NUC is continually creating new uses of PC by minimizing existing PC, and it has a unique meaning of suggesting new direction of computing even in embedded and enterprise markets. Intel NUC kit NUC5i5MYHE is the first product among NUC products to being applied vPro technology, so possessing the high quality of security and management is its most stand-out characteristic. In addition, as security and management are reinforced through vPro technology with low power, high performance, and small size that NUC originally had, the range of making use of NUC is largely extended. In fact, management ability provided by Intel’s vPro technology is very favorable even if compared to present main makers’ servers. Intel is introducing this NUC as a model for high-end embedded environment, but it can be efficiently used for constructing highly integrated distributed processing environment of data center. A key point that makes the utilization possible is management technologies such as AMT provided by vPro technology. Furthermore, as the utilization becomes possible, it will affect micro server which is the most similar type of a small form factor in any way. Even at this aspect, we think that NUC clearly lives up to its name ‘advanced computing unit (Next Unit of Computing) ’. On top of that, NUC-server solution production and launching of True Networks Japan(www.nucserver.com) created bigger industrial value with the evolution of NUC.